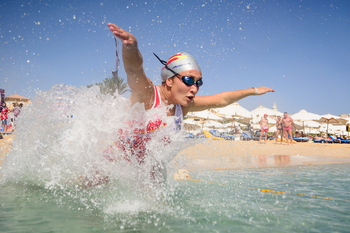 Czech Republic duo Eliska Pribylova and Ondrej Svechota made it two gold medals in two days as they picked up a second Mixed Relay title on day two of the UIPM 2018 World Biathle/Triathle Championships in Sahl Hasheesh, Egypt. Pribylova & Svechota (CZE) added Triathle gold to the Biathle prize they won on day one, this time with a huge winning margin of more than a minute. Elsewhere on day two, there was a historic first international medal in UIPM Sports for Nepal, as Saloni Lama and Rahul Darshan won bronze in the Under 19 category. The podium was an all-Asian affair as the Nepalese duo joined gold medallists Kazakhstan (Ashraf Kamalova & Denis Tunitskiy) and silver medallists India (Ahilya Sachin Chavan & Ritik Sharma) in receiving their medals. Check out all results from the UIPM 2018 World Biathle/Triathle Championships, which runs from October 25-28 with the individual Biathle competitions taking place on October 27.